Osteoporosis exercises for older women provides a great way to prevent further deterioration of bone mass and density. If you suffer from osteoporosis, certain exercises are much more effective at improving your bone mineral density (BMD) than others. Read on to find out which exercises are best for you. Whenever you begin an exercise regimen, you should contact your doctor for an evaluation and discuss the types of exercises you are interested in doing. Some movements may cause injury or aggravate current injuries. Don't overdo it when you first start exercising. Your body needs time to build up strength and endurance; pushing your body to do a movement it's not prepared to do can result in injury. If you already have osteoporosis, you will not be able to recover bone loss, but you can stop it from getting worse. Calcium is absorbed into the body when there is a need for it and exercise is one of the best ways to increase the demand for calcium. If you choose not to do anything, your bones may become much more brittle, and you might be more susceptible to broken bones due to a fall. Three of the best types of osteoporosis exercises for older women are flexibility, resistance, and weightlifting. Flexibility exercises help prevent injury because your joints are able to bend much easier if you happen to fall. Yoga, Pilates, and tai chi are great ways to increase your flexibility. Check out these sites for a selection of DVDs available to help you incorporate workouts for flexibility into your life. Resistance involves using weights and performing specific movements. An example of resistance training is taking a weight; do curls by bending at the elbow to bring the weight up to your chest. You can raise the weight above your head as well. You can use either free weights or specific machines designed for weight training. Here are some DVDs available for purchase online to help you start your strength training workout. Weight-bearing exercises are aerobic and include walking, dancing, and step climbing. 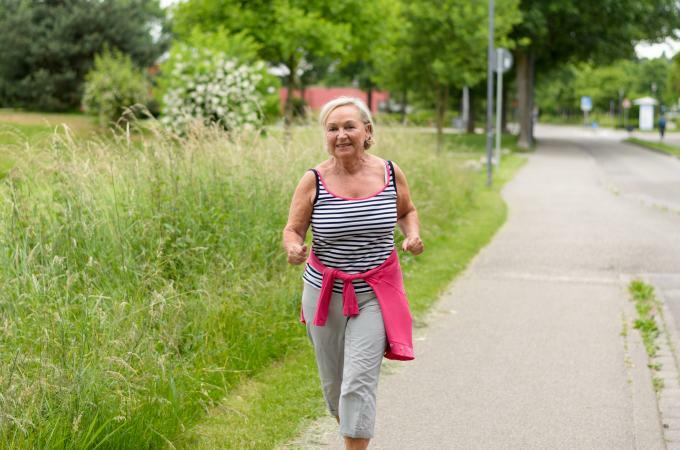 Walking is one of the best exercises for individuals with osteoporosis especially if it's done outside. The sun helps your body absorb vitamin D, which also helps your bones. High intensity walking or other aerobic exercises are much more effective than low intensity. High intensity means that you briskly walk instead of taking a leisurely stroll. Its best to do weight-bearing movements for at least 30 minutes a day even if you break it up into smaller increments. Exercise can sometimes feel like a chore, but if you do it with others, it can turn into a great social activity. Many senior centers have exercise classes you can join, or you can invite people from the center to do some workouts with you. The more people you can find who want to exercise with you the better your chances are at staying motivated and keeping yourself physically fit. It's time to take back control of your body and have fun while doing it!